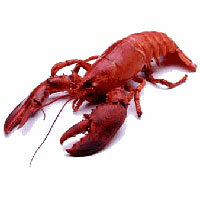 Occurrence: Generally eaten as cooked lobster but also in mixed seafood dishes such as paella. Lobsters along with crabs, crayfish, and shrimps are crustaceans. Food allergy to crustaceans is relatively common, symptoms ranging from mild oral allergy to severe symptoms such as anaphylaxis. Cooking does not remove the allergen. Crustacea are the third most important cause of food induced anaphylaxis after peanuts and tree nuts (cashews, almonds, pecans, walnuts, etc.). Thus crustacea and products thereof are listed in annex IIIa of the EU directive on labelling of foods and must be labelled when used as ingredients in pre-packaged food. This entry includes data on several species of lobsters and crawfish. There are two allergens with protein sequences which are tropomyosins from different species. 4. The red swamp crayfish, Procambarus clarkii, NEWT 6728. 3. Panulirus argus, NEWT 6737. An alternative grouping to that from NEWT or ITIS is given by http://tolweb.org/tree?group=Decapoda. Symptoms:As patients almost always react to shrimps, crawfish, lobsters and crabs, there are no reports of reactions specifically after eating lobsters. Halmepuro et al (1987)  describe the 23 patients who donated sera as having analphylactic, gasterointestinal or respiratory reactions to crustacea. Halmepuro et al. (1987)  made extracts from crawfish (Procambarus clarkii), spiny Lobster (panuliris argus), white shrimp (Litopenaeus setiferus) and blue crab (Callinectes sapidus) which were boiled for 15 minutes, peeled and homogenized in approximately 2 ml/g of phosphate buffered saline, pH 7.2 (PBS). After mixing overnight at 4°C, the extract was centrifuged at 16000 x g for 30 minutes at 4°C. Supernatants were concentated by ultrafiltration with an Amicon YM2 (cut-off 2 kda) and exhausively dialysed against PBS with a 3.5 kDa membrane. The extract was centrifuged at 66000 x g for 30 minutes at 4°C and the supernatant aliquoted and stored at -20°C. A maximum of 10 mg/ml extract was used. Protocol: (controls, definition of positive etc)Halmepuro et al. (1987)  defined a positive SPT as giving a wheal of 2 mm greater diameter than the negative control. Halmepuro et al (1987)  reported testing 23 patients. Summary of Results:Halmepuro et al (1987)  reported that all 23 patients gave a positive skin prick with lobster and crawfish. Halmepuro et al. (1987)  made extracts from crawfish (Procambarus clarkii), spiny Lobster (panuliris argus), white shrimp (Litopenaeus setiferus) and blue crab (Callinectes sapidus) which were boiled for 15 minutes, peeled and homogenized in approximately 2 ml/g of phosphate buffered saline, pH 7.2 (PBS). After mixing overnight at 4°C, the extract was centrifuged at 16000 x g for 30 minutes at 4°C. Supernatants were concentated by ultrafiltration with an Amicon YM2 (cut-off 2 kda) and exhausively dialysed against PBS with a 3.5 kDa membrane. The extract was centrifuged at 66000 x g for 30 minutes at 4°C and the supernatant aliquoted and stored at -20°C. Lehrer & McCants (1987)  made similar extracts including oyster with the a final centrifugation at 78000 x g.
Halmepuro et al. (1987)  used RAST and crossed-immune electrophoresis (CRIE). Lehrer & McCants (1987)  used RAST and RAST inhibition. Leung et al. (1996)  and Leung et al (1998)  used immunoblotting. Halmepuro et al. (1987)  tested 23 sera. Leung et al. (1996)  used sera from 9 shrimp allergic subjects. Leung et al (1998)  used sera from 10 crustacea allergic subjects. Halmepuro et al. (1987)  reported that all 23 sera were positive by RAST (>18% of added radioactivity) with lobster and crawfish. CRIE suggested that the allergens of shrimp, crawfish and lobster were similar. Lehrer & McCants (1987)  reported a strong correlation between RAST results for oyster and crustacea (0.82 for lobster). Raw and cooked oyster were inhibited to 85% and 89% by lobster extract (see oyster for further information). Immunoblotting separation:Leung et al (1996)  separated the extracts by SDS-PAGE in a 10% separating gel with a 5% stacking gel. Samples were boiled for 10 minutes in buffer with 4% SDS, 10% 2-mercaptoethanol before loading. Immunoblotting detection method:Leung et al (1996)  electrophoretically transferred proteins onto a nitrocellulose filter in a semi-dry transfer cell (Bio-Rad) at 15 V for 1 hour. Strips of the blot were blocked with 3% (w/v) nonfat dried milk in PBS for 30 minutes. Strips were incubated in the test serum (1:10 dilution) in PBS with 3% milk at 4°C overnight with shaking. The strip was washed in PBS-Tween (0.05% Tween-20 in PBS) at room temperature three times for 20 minutes each. The bound IgE on the strip was detected by incubation with 125I-labeled anti-human IgE (Sanofi-Pasteur Diagnostics, Ohaska, Minn.) in PBS buffer with 3% milk at 4°C overnight. Nonspecific binding was removed by washing the strip with PBS-Tween at room temperature three times for 20 minutes. The strips were exposed to x-ray film with an intensifying screen from 24 hours to 1 week at -70°C. Leung et al. (1996)  reported that 9/9 sera from shrimp allergic patients bound to an allergen from Panuliris homarus at 38 kDa (see greasybacked shrimp entry). Leung et al (1998)  reported that the recombinant Hom a 1, rPan s 1 and rMet e 1 ran as 60 kDa GST-fusion proteins and bound IgE from sera from 10 crustacea allergic subjects. Leung et al. (1996) , Leung et al (1998) , Leung et al (1998)  and DeWitt et al. (2004)  report details of the similar tropomyosin allergens from shrimps, lobsters and crabs together with IgE cross-reactivity between both extracts and recombinant allergens. Several molluscs are also shown to have cross-reactive tropomyosins. Halmepuro et al. (1987)  had earlier reported IgE cross-reactivity between extracts from crustacea and Lehrer & McCants (1987)  extended this to oysters. Binder et al (2001)  reported that immunoblots of an extract of lobster (H. gammarus) show IgE binding near 40 kDa using sera of individuals allergic to the indianmeal moth. This was inhibited by preincubation of the sera with recombinant indianmeal moth arginine kinase. Thus arginine kinase may also be a lobster allergen. Crustacea have been frequently reported as occupational allergens. Several species in addition to those mentioned in articles on food allergy have been reported as occupational allergens including snow crabs (Cartier et al, 1986 ; Cartier et al, 2004 ), Nephrops norvegicus or scampi (Griffin et al, 2001 ) and gammarus shrimps (Fontan et al. 2005 ; Baur et al. 2000 ). Occupational allergy probably involves aerosols (Bang et al. 2005 ; Goetz & Whisman, 2000 ; Desjardins et al 1995 ) and both the stability of tropomyosins in boiling water (Lehrer et al. 1990 ) and their cross-reactivity may be significant. Other allergens such as the 97 kDa allergen of scampi are also stable as aerosols (Griffin et al, 2001 ). Nephrops is relatively closely related to Homarus which may produce similar allergens. Contact determatis has also been reported (Aasmoe et al, 2005 ; Scharer et al, 2002 ). Halmepuro L, Salvaggio JE, Lehrer SB. Crawfish and lobster allergens: identification and structural similarities with other crustacea. There is a splice isoform O44119-2 which translates AF034954; AAC48288.1. 34 kDa (Pan s 1 from Panuliris stimpsoni, Leung et al. 1998 ). 36 kDa (tropomyosin from Panuliris argus, Musmand et al. 1993 ). 38 kDa (tropomyosin from Panuliris homarus, Leung et al. 1996 ). Allergen epitopes:Not known for Hom a 1. However, the data on shrimp allergens Pen a 1 and Pen i 1 is likely to be relevant because of cross-reactivity. Leung et al (1998)  reported the cloning of tropomyosins from Homarus americanus, Hom a 1, and Panulirus stimpsoni, Pan s 1. The sequence from Panulirus stimpsoni has 271/274 (98%) residues identical to the splice isoform O44119-2 from Homarus americanus. Leung et al (1998)  reported that binding of IgE from sera from 10/10 crustacean allergic subjects to lobster extracts was inhibited by rMet e 1, rPan s 1 or rHom a 1. DeWitt et al. (2004)  report that the level of sequence identity of tropomyosins with Pen a 1 is 99% for lobster (Homarus americanus), 92% for crab (Charybdis feriatus), 78-82% for insects and dust mites, 71% for a nematode (Caenorhabditis elegans) and 57% for both blue mussel (Mytilus edulis) and human, suggesting that IgE cross-reactivity is very likely for the invertebrate tropomysosins. DeWitt et al. (2004)  also showed specific IgE binding to recombinant Pen a 1 and seven invertebrate extracts with 9 sera. 6 sera bound extracts from crustacea most strongly, 2 bound dust mite extract more strongly and one serum showed similar binding with both extracts. rPen a 1 bound 94% of the IgE from the 6 crustacea specific sera and gave 50% inhibition of the binding of extracts at about 0.1 µg/ml. Leung et al (1998)  report the production of recombinant Hom a 1 (also rPan s 1 and rMet e 1) as 60 kDa GST-fusion proteins using the pGEX 1 expression system in E. coli. Only the purification of rPan s 1 is explicitly described starting with a 500 ml culture. Cells were suspended in 5 mls of lysis buffer (1% Triton X-100, 1% Tween-20, 10 mM DTT) and sonicated. The cell debris was demoved by centrifugation at 6000 x g for 15 minutes and the supernatant was added to glutathione agarose (Sigma, St. Louis, MO). After incubation for 2 hours on a rocker, the glutathione agarose was washed 3 times with PBS, pH 7.3, containing 1% Triton X-100 and the bound protein eluted in 2 mls of 5 mM reduced glutathione in 50 mM Tris/HCL, pH 8.0. Native tropomyosin was prepared from Homarus americanus extract was SDS-PAGE as described in immunoblotting. Other biochemical information:There is also a sequence deposited of slow-tonic S2 tropomyosin http://us.expasy.org/uniprot/Q6E7L4 with 279/284 (98%) identity. Allergen epitopes:Not known for Pan s 1. However, the data on shrimp allergens Pen a 1 and Pen i 1 are likely to be relevant because of cross-reactivity. Leung et al (1998)  report the production of recombinant Pan s 1 (also rHom a 1 and rMet e 1) as 60 kDa GST-fusion proteins using the pGEX 1 expression system in E. coli. Only the purification of rPan s 1 is explicitly described starting with a 500 ml culture. Cells were suspended in 5 mls of lysis buffer (1% Triton X-100, 1% Tween-20, 10 mM DTT) and sonicated. The cell debris was demoved by centrifugation at 6000 x g for 15 minutes and the supernatant was added to glutathione agarose (Sigma, St. Louis, MO). After incubation for 2 hours on a rocker, the glutathione agarose was washed 3 times with PBS, pH 7.3, containing 1% Triton X-100 and the bound protein eluted in 2 mls of 5 mM reduced glutathione in 50 mM Tris/HCL, pH 8.0.